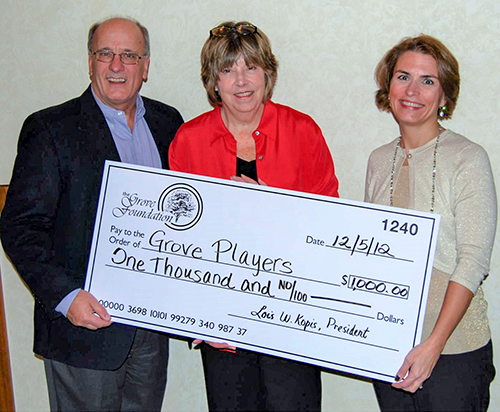 In 2012, the Grove Foundation established an annual grant program and has been awarding funding to local organizations and programs every year since. The goal of the grant program is to support efforts that are unique, eventually self-sustaining and/or serve diverse populations. In order to be considered, projects must benefit Downers Grove residents. To be considered for a Grove Foundation grant, the organization must submit an application via U.S. Mail before the deadline. Click here for more information and for the Grant Application. Downers Grove North (DGN) Courtyard Expansion Project's mission is to create an accessible environment with a paver pathway, wheelchair accessible outdoor table and swing for all students especially those with mobility impairments and cognitive delays. Students for vocational instruction and sensory integration use the Courtyard Garden. DGN and DGS Memorial Peace Garden were created to commemorate the sacrifices that nearly 70 Downers Grove alumni have made and promote the idea of peace around the community. The gardens honor those who lost their lives and serve as a permanent reminder to students of the ultimate sacrifices that were made. The gardens were built to both remember people but also to teach the importance of peace in our society and that war should be a last option.